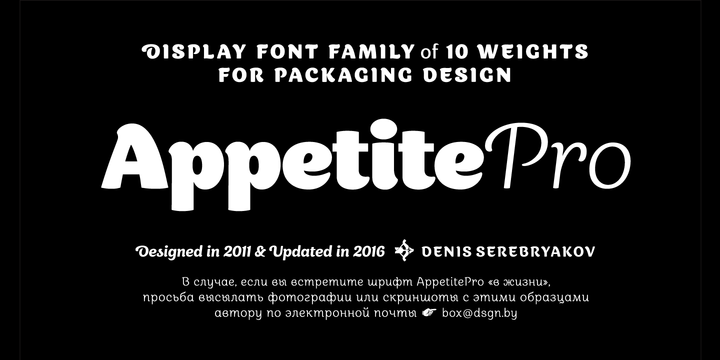 Appetite Pro is a typeface created by Denis Serebryakov and published by Dzianis Serebrakou which is the improved form of basic font, Appetite. Available in 5 weights with accompanying italics, it contains multilingual support and a wide range of OpenType features such as: start & end alternates, several swash letters, dingbats enriched, nessesary numerals set, popular currency signs and so on. It was designed to be suitable for packaging design. Enjoy! Price: starting from $39 for one font to $300 for all 10 fonts. A font description published on Friday, March 4th, 2016 in Denis Serebryakov, Dzianis Serabrakou, Fonts by Alexandra that has 5,546 views.